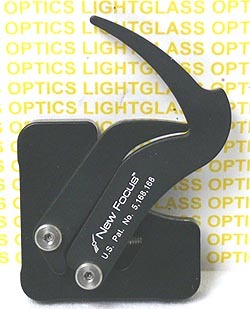 The New Focus 9832 Fixed Opti-Claw Mount will hold any optical component with a diameter of 0.10" to 2.00" ( 2.5mm- 50.8mm), and will automatically center the optic to withing .005". Ideal for use when different optical elements need to be changed out quickly. This mount can also be locked when needed - making it as rigid as a solid mount. The jaws have Vee-grooves for holding thin optics such as lenses, filters, or beamsplitters.